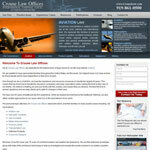 ﻿ Helicopter Accident Lawyers: Aviation / Aircraft Collision Attorneys. Crash Investigation, Malfunctions, Lawsuits. Helicopters are useful machines that can do what no other aircraft can do: fly forwards, backwards, hover, descend and ascend vertically, and land and takeoff without runways. This has made them effective in saving lives, law enforcement, executive transport, offshore transport, sightseeing, recreation, and in military administrative, supply, assault, attack and medevac operations. The benefits of helicopters come with a heavy burden: they are intricate, complex machines that require the highest levels of design, construction, maintenance and operational skill. If any one of these components is missing, the results are usually disastrous for its occupants and their families. What was designed to help humans with their daily lives all too often causes great harm to those who use them. We are here to help you through the process and answer any questions you might have about what to do now and potential causes. Our background in operating, maintaining, test flying helicopters and in investigating accidents has prepared us to be responsive to your family’s needs. We can also answer your questions about how to proceed with insurance matters and whether you need legal representation. 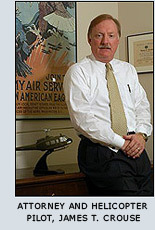 We have experience in litigating virtually every type of helicopter accident, locally, nationally and internationally. If you need legal representation, our combination of legal and aviation experience allows us to provide our clients with the knowledgeable representation needed for complex aviation litigation. Please call us (919)861-0500 or e-mail us (JTC@CrouseLaw.com), if there is any way we can be of service.